Start MacroModel running. Build a cyclohexane molecule in its chair conformation (INPUT mode). Make sure all the correct hydrogen atoms are present using H ADD and H DEL. Go into the ENRGY mode and minimise the structure using the MM2 force field, following the instructions at the end of this booklet (Remember to choose New when asked if you want an Old or a New command file). Make a note of the energy, then repeat the procedure for the boat conformation of cyclohexane. Are the relative energies as you would expect? Go into the ANLYZ mode, and use ADist, BAngl, DAngl to measure the bond lengths and angles of the two molecules. How do they differ? 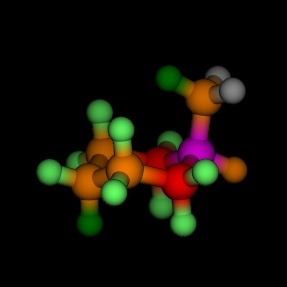 Click on Opt to view the molecule as a CPK model or a ball and stick model. Is there a hole in the middle of cyclohexane? Build a DNA base pair by returning to INPUT mode, choosing the NCUCLEI submode. Click on Ad then click somewhere on the screen (If you click first on GROW and then choose the names of the bases, it will grow a chain of DNA). Go into the ENRGY mode. Try to minimise the base pair. You should first get a message saying that the lone pairs mismatch. Ask the program to correct this. Minimisation will start, but quickly stop with an error message. 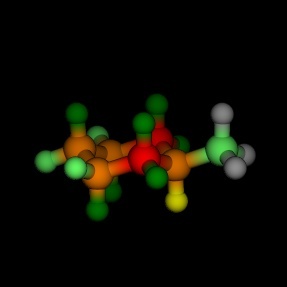 This is because MM2 does not have the correct parameters for the molecule. The main problem is that the molecule does not have all the hydrogens drawn in. Some force fields, such as AMBER, can cope with this, but MM2 cannot. You can add hydrogens by returning to the INPUT mode, and clicking H Add three times. You should now be able to minimise the molecule (New command file). Bredt's Rule states that double bonds will not form across bridgehead carbons. Build each of the unsaturated ring structures and record the energy of each after full minimisation. Does this account for Bredt's rule? The keto-alcohol C can be methylated to give the methylether D, as expected. Surprisingly, the keto-alcohol E reacts to give the same product. The rearrangement can be rationalised as a retro-aldol process preceding the methylation. But what is the driving force for the rearrangement? Calculate the energies of the products, or of suitable intermediates, to find out. Click on READ. In the box that appears, click on PDB, to read in Protein Databank Format files. Now Click on Open. Move the mouse to the upper window of this new box, and type /usr/local/brookhaven/*.ent. Click on Filter. A short list of filenames should now appear. This is just a small selection of files in the Brookhaven Protein Database. Click on any of the names, then click Open Read. The protein you have selected should appear on the screen. Click on PEPTID, choose an amino acid from the list, then click on any residue. This will perform site directed mutagenesis!